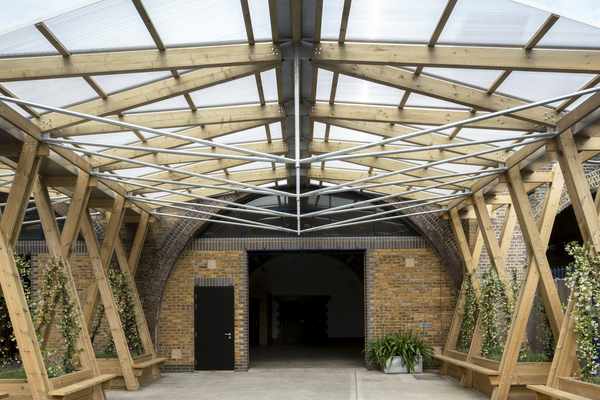 Responding to the form of the brick railway viaduct, this timber, steel and polycarbonate canopy extends from two arches to form a versatile and adaptable event space, built using modular structural components. The AMP Studios Pavilion on the Old Kent Road was conceived as a simple, coherent structure that would echo and complement the urban setting between the railway line and busy road. Accepting of its inner-city environment, the pavilion serves as a focal element, enticing users into the space. 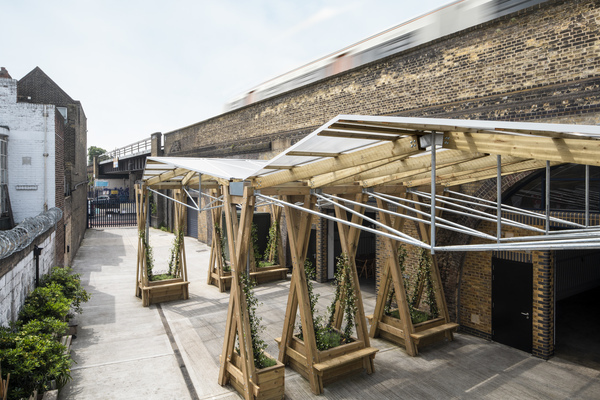 The structure transforms the forecourt and extends the sheltered area, whilst promoting increased visibility from both the road and the railway above. The brick arches of AMP Studios accommodate an interesting mix of uses. 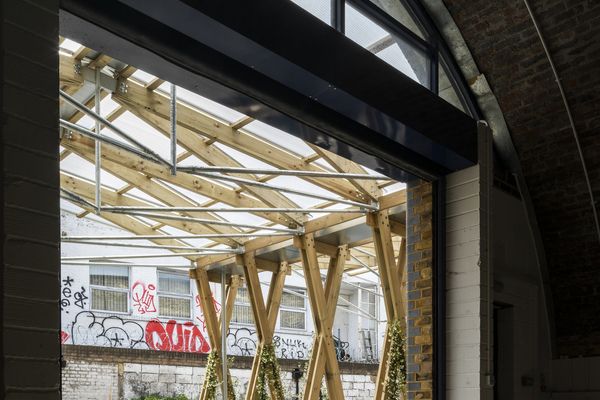 The two first arches are studio spaces for artists and creatives, whilst the two at the rear serve as combined/adaptable spaces for private parties and events. 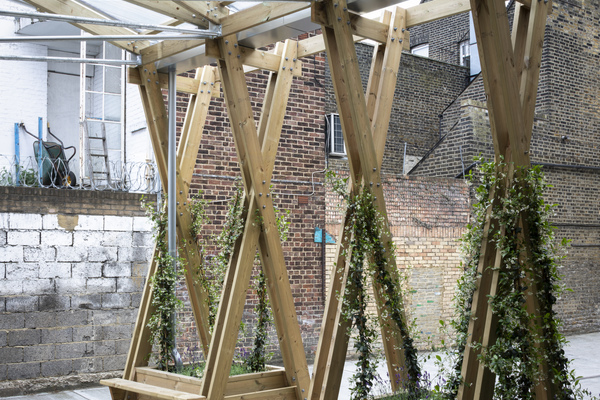 In order to provide a sheltered area to the forecourt of these end two arches, the pavilion – a temporary timber, steel and polycarbonate structure – extends out, creating a unique focal point, whilst amalgamating the individual elements. Maverick Projects initially approached local architects Gruff Limited to design the fit-out of the first two arches, partitioning them into four artists’ studios. The plan was to use the end two arches for events, and Gruff spotted the irresistible opportunity to create something both playful and respectful of the existing Victorian brick infrastructure. The pavilion, an honest and efficient piece of structural design, both exceeded the brief and the client’s expectations for what could be achieved in the space. 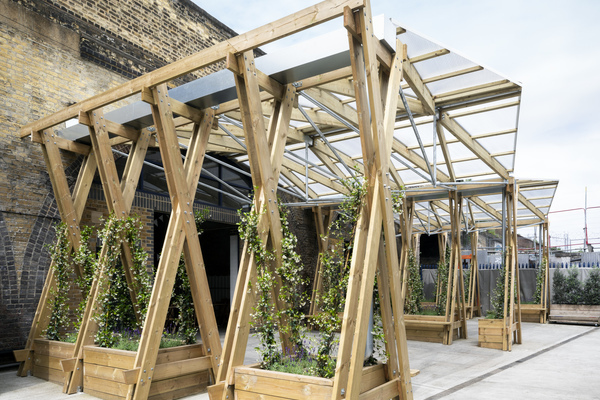 The canopy succeeds in creating an atmosphere in which something special and meaningful can take place: a little pocket of magic on the Old Kent Road. Maverick offer unique locations for art exhibitions, theatre, events, filming and photography shoots. Their brief was to transform this gritty urban pocket in south east London into a venue befitting of one of the most important days in people’s lives – their wedding day. The venue complements Asylum, a Grade II listed former chapel also managed by Maverick which has been a venue for weddings for a number of years. Working with structural engineers Foster Structures, the form of the pavilion was inspired by the geometry of the existing masonry arches of the Victorian railway viaduct. The truss form of the roof is structurally efficient. It enables an expressive but honest geometry to be formed using a simple series of identical repeated elements and nodal connections, as well as breaking down the large span into set of smaller, lighter elements able to be easily fabricated and then manoeuvred into position by hand. The timber and steel sizes were selected to facilitate the use of standard, easily-available elements, and ensure that rational connections were possible at the truss nodes. This also helped manage the budget restrictions by using widely-available building components. The criss-cross support legs provide both vertical support to the roof and lateral restraint. The legs are integrated with timber planters which help provide sufficient weight to resist any upward wind loading on the pavilion roof. In time, will cover the structure in greenery to create something of an Old Kent Road oasis. Seating is also integrated into the space to promote comfort and enjoyment within it. The choice of materials and elements reflects the structural forces in the pavilion roof – the larger timber members forming the compressive top chords and slimmer steel tubes forming the bottom tension chords to create a structurally legible overall form. The modular design reduced build time and disruption to the ongoing resident artists. The raw and functional palette of timber, galvanised metal and polycarbonate presents a clean palette for those using the space for weddings, parties and other events. These bare materials reflect the railway infrastructure and the urban setting, whilst also providing a neutral backdrop which can be decorated and dressed to any taste and personal style. Gruff Limited is an architectural design practice based in Brockley, south east London. Established eight years ago by founding director Rhys Cannon, the practice has grown to a tight-knit team of ten. A young and forward-thinking practice, we pride ourselves on seeing each project as a challenge to learn something new and try something different. Our collective passion for making, innovating and taking leaps into the unknown means we experiment with materials, forms and technical resolution. The practice was recently shortlisted for the Building Design Young Architect of the Year Awards. Foster Structures are structural engineers who help create buildings and installations that make special places – and celebrate the constraints which define them. Our input is thoughtful and rooted in an understanding of materials and construction. We believe that creativity and innovation are essential – as are enthusiasm and a commitment to working with others. The practice is led by director Stephen Foster whose previous work includes Zaha Hadid’s Maggie’s Centre, Kirkcaldy and Ordrupgaard Museum in Copenhagen whilst working at Jane Wernick Associates. More recently Stephen has been a director at Milk Structures.